"Fubica has swum thousands of miles and has now found her way to the protected zone around Tristan Da Cunha," said Exeter Ph.D. student Liliana Poggio Colman, who is on a scholarship from the programme Science Without Borders (CNPq), funded by the Brazilian government. "These turtles only nest every two or three years, so we don't expect her to return to land for many months to come. "Some stay in the coastal waters of South America and others – like Fubica – cross entire oceans. "She will be spending her time foraging for jellyfish, which makes up most of these turtles' diet." Poggio Colman, who tagged the turtles along with Exeter's Professor Brendan Godley, said: "Fubica was seen nesting four times late last year. 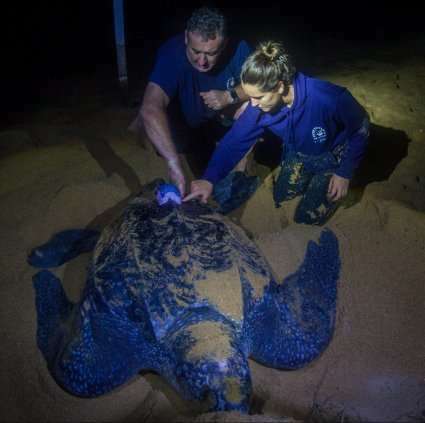 "During this period she moved along the entire coast of the state of Espírito Santo, eastern Brazil, showing how important those areas are for leatherbacks. "After leaving the beaches she spent a lot of time foraging off the Brazilian coast, where there is high marine productivity and intense fishing – meaning threats from nets and hooks. "She then began to move eastwards, and is currently near Tristan Da Cunha (inside the UK's Exclusive Economic Zone around the islands)."